Max tells Gus he has to go and pick up Steph. Gus notices Max still has a little beer in the bottom of his glass. Gus suggests Max finish it before he goes. Max says he really needs to go. Connor comes over and asks Max if he's really going to leave that bit as Connor will be offended. Max drinks it, commenting that it tastes unusual. Connor says that's the secret ingredient. Max stumbles forward into Gus then apologizes. Gus asks Max if he can get a life back to his place so he can start dinner. Max tells Gus he can't cook his own birthday dinner. Gus says It's ok and tells Max he's not sure he wants Steph to do it saying that Steph is great in every way but her cooking is the pits. The phone rings and Connor answers. He goes into the pub office and tells Lou there is a call for him, a bloke names Gavin. Lou takes the call asking Gavin how many he could get hold of and if they're good quality. HE tells Gavin to give him a call back when they “Fall off the back of the truck”. He then tells Him to call him on his mobile next time as he doesn't want everyone to know his business. Steph is telling Max to hurry up. Max tells her there is heaps of time. Steph says she knows but she's scared. Max goes over to hug her and she tells him he smells like a brewery. Max walks out saying he only had two beers and asks Gus to back him up. Gus suggests to Steph he should drive. Steph wants to know why. Gus says just incase she was worried about Max. Steph wants to know how many drinks Max really had. Gus says he didn't keep count. Steph says Max isn't a big drinker and he wouldn't start especially today when he knows how important it is. Gus again asks Steph if she wants him to drive so they don't have to look for a parking spot. Steph tells he they'll be fine. Max comes out and they go to leave. Max tells Steph she is going to be fine. Lyn is trying to put together some camp beds. Jack walks in and she asks him to help. Jack says he doesn't do dirty work anymore now that he's a draftsman. Lyn and Valda rush over and congratulate him. Lyn talks about Scully and Son with Joe on the building side and Jack on the drawing side. Valda asks what Oscar will be doing. Jack suggests decorating. Lyn tells Jack not to say that to his dad. Lou asks Connor if he's heard from Carmella. Connor says he got a postcard from her. Lou asks if he's seen her. Connor reminds him that she's in Italy. Lou tells him that Rocco said she was back because she was homesick or there was a wedding or something. Lou's mobile rings. Lou asks if the goods are there and asks where they should meet. Lou gets off the phone and tells Connor he's going home. Lou takes the bag of money out of his compost container and takes some cash out. Harold peers over the fence and says “knock, knock”. Lou jumps and shuts the compost bin. Lou asks Harold what he is doing as he gave him a fright. Harold says he's just doing what neighbours do popping their heads over their neighbours fences. 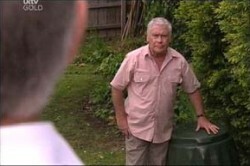 Harold tells Lou he needs worms for his compost and he offers to get him some. Lou says it's fine. HAROLD: Lou, I'm just being like I use to be, giving gardening tips…um.. discussing compost. Nothing inflammatory in what I'm saying is there? Lou says no. Harold tells Lou he's been thinking about him all morning and about his money problem and he's worked out what Lou can do about it. LOU: And what would that be? HAROLD: You're going to have to work harder. Lou looks at Harold and says he doesn't think financial advice is his forte. Lou then says he's going inside. HAROLD: Lou, was I being friendly enough or not friendly enough? Lou looks at him confused. Max is driving the car. Steph is talking about doing Yoga. Max is having trouble keeping his eyes open and his vision goes blurry. Max passes out and the car goes into the path of an oncoming car. Steph screams and pulls the car out of the way and onto the grass. Max's head falls forward on to the steering wheel. Steph starts to panic asking him what's wrong. Max doesn't answer and his eyes roll in the back of his head. Steph gets out of the car and runs around to the other side of the car and puts Max into the passenger seat. Connor comes home and is looking around. Someone grabs him from behind and holds him against the wall. CONNOR: I haven't seen her, I promise. I didn't know she was in the country until today. I promise. Not the boot Rocco, please not the boot. Stuart lets him go and says that worked much better then he thought. Connor asks him what he's doing. Stuart says it's a new maneuveur he learnt at police training. Stuart asks him about the ‘boot'. Connor says it's a long story and he doesn't want to talk about it. Gus is on the phone checking to see if there are any traffic accidents. Steph comes in asking Gus for help with Max. She tells Gus Max passed out at the wheel. Gus puts Max in his room and tells Steph he just needs to sleep it off. Steph asks Gus to stay and look after Max but Gus says he'll drive Steph to her appointment. Steph says no but Gus insists on driving her and Steph gives in. Lyn puts Oscar to sleep. Jack is talking about the show and Sindi. Valda tells Jack to give Sindi a break and Valda tells Jack she can see he likes her Michelle is standing in the doorway: Still chasing skirts hey Jack! Jack runs over to Michelle and Hugs her. Valda calls out to Lyn to come and see who's here. Lyn comes out and sees Michelle. She looks shocked and hugs her. Max walks into the kitchen and sees Gus and Steph. MAX: Did you make it to the doctors OK? STEPH: Yeah, Gus took me. STEPH: I'm not telling you anything until you tell me how you got yourself into that state. You know you nearly killed us. STEPH: Oh come on Max, you must have some idea. GUS: Maybe it's a virus or something. You can't have had that much to drink. MAX: No, well I didn't. I honestly don't know what happened. STEPH: Are you feeling better? MAX: Yeah. Still kind of sleepy and I've got a headache but… are you going to tell me what the doctor said. STEPH: I'm still in the clear. Max hugs Steph: Oh Steph, that's such good news. I love you so much. I'm sorry I couldn't be there with you. STEPH: Gus took me, he was great. GUS: Careful, soon you won't know how you lived without me. Lyn gets off the phone saying Steph is coming straight over. Michelle says she's missed all the family stuff. Jack add “Scully insanity”. Steph runs in yelling “Shelly”. They hug and Steph tells Michelle she's looking beautiful. Jack asks her how long she'll be staying for. Michelle tells them for her semester break, six weeks. Steph asks Michelle about New York and Michelle says it's good. Steph says “just good?”. Michelle says she can't tell, not infront of the parentals. Michelle wants to know what has been happening while she's away. She says Jack told her about the Kennedy's. Lyn says not to get her started on that and asks her if she heard about Lou and Trixie. Harold is walking in the park with an apple in one hand and a quiche in the other. He sees Lou standing next to his car with another man. Lou hands the other man some cash. Stuart comes out and tells Connor he found a message on his pillow, he pulls out an old boot and pretends to be scared. Connor says very funny but it wasn't that type of boot. Stuart asks if it was footy boot, cowboy boot, car boot. Connor looks at him. Stuart makes a joke about bodies being about to fit into carboots. Connor says he's not funny and car boots are very small. He starts to talk about Rocco and there's a knock at the door. Connor looks worried. Stuart asks who it is. Carmella answers and Connor hides behind the couch. Carmella asks if Connor is home. Stuart says no but Carmella wants to know who he was talking to. Stuart puts on an Irish accent and says himself. Stuart and Carmella are talking about Connor. Stuart tells Carmella she could get any guy she wants and shouldn't waste her time on Connor. Carmella says she likes him because he's sweet and not pretentious. Stuart said that must be why he gets all the girls. A different girl every night. Stuart says he shouldn't' of said anything. Carmella gets angry saying her father was right and Connor promised to wait for her. Stuart tells her he'll tell Connor she stopped by. Carmella says she'll stay she wants to see Connor and make his suffer. Bob runs over to Connor and starts barking. Carmella gets up and sees Connor hiding behind the couch. Stuart runs out of the house. Conner: Carmella… Hi…. How long have you been here? I've been… want some coffee? Michelle walks out in her robe and her make up on. Lyn sys she's looking all done up and asks her if she's going to see someone special. Michelle says yes and asks Lyn if Connor ever talks about her. Lyn tells Michelle things may not be the same as when she left. Michelle: We're supposed to be together. Connor knows that too. We're soul mates. I'm going to get him back. Connor tells Carmella none of what Stuart said was true. Carmella wants to get back with Connor but Connor is worried about Rocco. Carmella says she will give Connor two weeks to die for. Connor says no “You'll give your father ideas” Carmella tells him they'll take things one step at a time and she kisses him. Lou is trying the sell his latest scam “Fone Now”. Gus asks Max if he's still trying to make excuses for yesterday. Max says maybe it was Connor's brew. Steph tells Max that whatever it was maybe he should get it checked out. Steph leaves and thanks Gus again for yesterday. Max asks Harold if he wants another beer. Harold says no and goes to talk to Lou. Connor and Carmella walk out. Connor is in his robe and Carmella is in one of Connor T. Shirts. Carmella says she's like to go for a swim but Connor doesn't think it's a good idea. He's still worried about Rocco. Connor says he thinks he heard something. Carmella says it's the sound of a broken record. She tells Conner they should just be honest with her dad about their relationship. Connor doesn't want to. Carmella tries to persuade him asking him if their relationship is important. Connor says of course and she means everything to him. They kiss and Michelle walks in. Connor sees her and says “Misha”.